BREEZIN’ THRU Author Wins CMEA 50th Anniversary Song Contest! Jean McKen’s original composition “I Am Song, Je Suis Chanson” has been judged the winning submission in the prestigious song contest organized by CMEA/ACME to celebrate the organization’s 50th anniversary. The song was premiered and sung by all teachers at the 2009 OMEA Con Brio Conference in November. The lyrics can be viewed here. Listen to the SSA version of the song featuring soloist Heather Bambrick and a choir of music educators. Hear now. Watch video of full orchestra arrangement . SSA, SAB, and Unison versions of the song are available for sale to schools. The cost of I Am Song is $1.50 per octavo with a minimum purchase of 10 copies. To place an order contact Jean McKen by phone at 416-476-8014 or email jmcken@breezinthrutheory.com to Buy now. 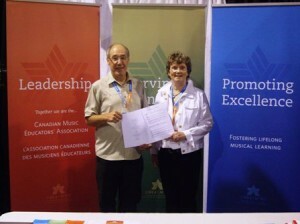 Jean McKen is donating all proceeds from the sale of the song to CMEA/ACME to create a special scholarship for young musicians. Jean says that when she was a child, it was clear that music was her calling but her family could not afford music education for her (a good instrument and lessons). Fortunately someone outside her family came through with support while she was in high school. Jean hopes that scholarships may help open up the world of music to other children in need.